Help us request that the Postal Service issue a set of Postage Stamps with Lightships on them. We can do this and helping out is easy!!! There have been six sets of Lighthouse stamps issued by the US Postal Service since 1990, the most recent was this year, 2013. Some of us think it is time to recognize the Lightships for the unique service they have provided the United States maritime community. From 1820 until 1983, these little known but extremely functional Aids to Navigation have been an important part of US maritime history. If you agree, then please help make this happen. Anyone can request that a subject be considered to appear on a U.S. stamp. This is done by writing to the Citizens' Stamp Advisory Committee, which is tasked with evaluating the merits of all stamp proposals. The Committee's primary goal is to select subjects of broad national interest for recommendation to the Postmaster General that are both interesting and educational. In addition to Postal Service's extensive line of mail use stamps, approximately 20 new subjects for commemorative stamps are recommended each year. Stamp selections are made with all postal customers in mind, not just stamp collectors. A good mix of subjects, both interesting and educational, is essential. The Committee meets four times yearly. At these two day meetings, the members review all eligible proposals that have been received since the previous meeting. No in-person appeals by stamp proponents are permitted. The criteria established by this independent group ensure that stamp subjects have stood the test of time, are consistent with public opinion and have broad national interest. 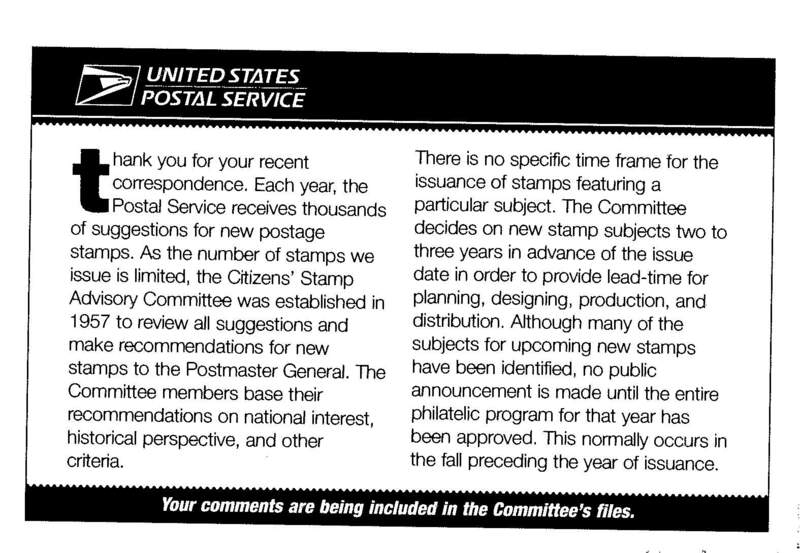 Stamp proposals must be submitted in writing via mailed letter to the Citizens' Stamp Advisory Committee (CASC). Proposals made by email will not receive a response. This allows everyone the same opportunity to suggest a new stamp subject. Subjects should be submitted at least three years in advance of the proposed date of issue to allow sufficient time for consideration and for design and production, if the subject is approved. All properly submitted proposals for eligible subjects will be reviewed by the Citizens' Stamp Advisory Committee regardless of how they are submitted, i.e., stamped cards, letters or petitions. For more information on the CASC, click HERE. The U.S. Postal Service and the members of the Citizens' Stamp Advisory Committee have set the criteria used in determining the eligibility of subjects for commemoration on all U.S. stamps and stationery. A set of Lightship stamps meets all of their criteria. When they receive your letter, you should receive a reply from the committee that looks like the postcard below.